Treehouses of any kind infuse a sense of wonder into kid’s and adults alike, so when Juli, the blogger mom behind The Slow Life, saw pictures of a treehouse built indoors, it inspired her to build her daughter’s first bed — and the treehouse bed was born. 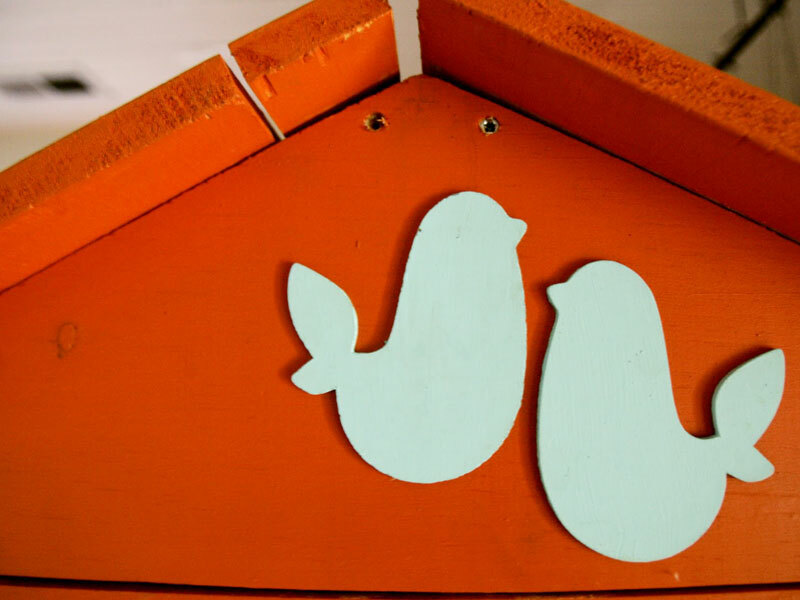 She drafted treehouse plans, let her two-year-old Tula Mirth pick paint colors (an orange exterior and eggshell blue interior), borrowed power tools from a friend, and built the whimsical bed. First, the bed was built outside before it was transported to the child’s bedroom. 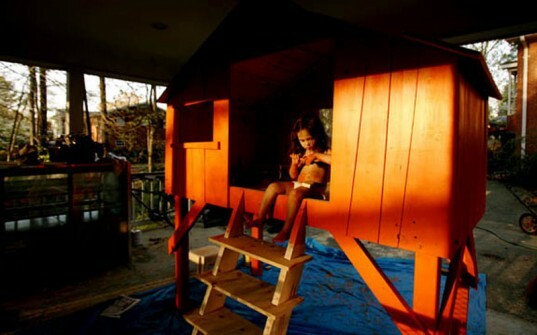 Tula Mirth helped paint her treehouse bed in her diaper, and still loves telling the story about how her bed was built. Juli says that everyone who comes over — young and old — always wants to climb up into the bed, fascinated by the treehouse concept. This treehouse bed is also a great idea for families tight on space. The lofted design lifts the bed high off the floor to allow for everything from bookshelves to storage to play space below. I love this bed! Is this a kit or are there instructions/list of how to build this available? @jpiniotes you may want to contact the folks at The Slow Life, linked to herein to get tips on how they crafted this bed. Treehouses of any kind infuse a sense of wonder into kid's and adults alike, so when Juli, the blogger mom behind The Slow Life, saw pictures of a treehouse built indoors, it inspired her to build her daughter's first bed -- and the treehouse bed was born. She drafted treehouse plans, let her two-year-old Tula Mirth pick paint colors (an orange exterior and eggshell blue interior), borrowed power tools from a friend, and built the whimsical bed.